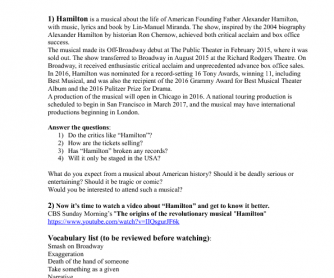 Hit Broadway musical "Hamilton" is getting more popular everyday, so I decided to make a worksheet dedicated to it. I'd say it's suitable for ss older than fourteen. It's perfect for intermediate and higher levels, but if a group is strong you can even give it a try with pre-intermediate level. 1) Introduction. Ask ss if they know anything about American history, especially Founding Fathers. 2) Reading. 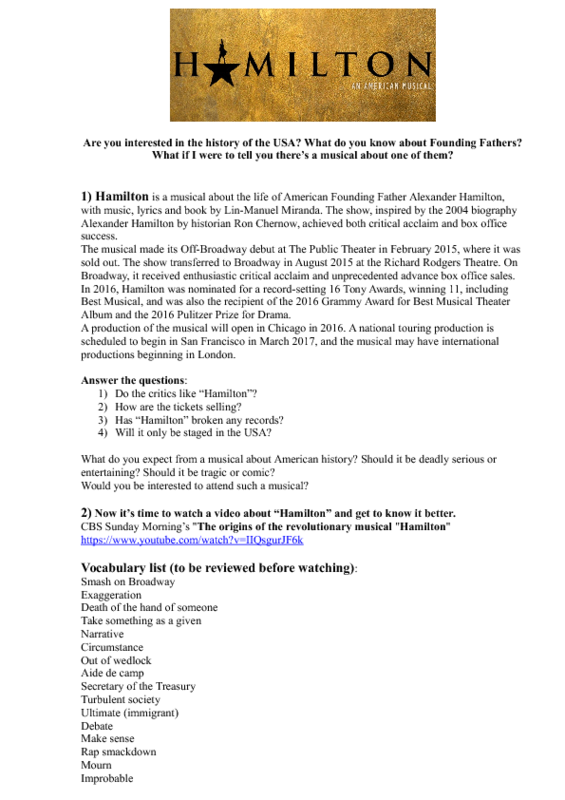 There's an extract from Wikipedea page about the musical followed by comprehension questions. 3) Vocabulary review + video. Now we're getting to the main part. Make sure ss understand all the words in vocabulary list, then you can watch the video (link included) and finally answer the questions. The video is on Youtube https://www.youtube.com/watch?v=IIQsgurJF6k and it's called "The origins of the revolutionary musical "Hamilton". If ss are interested and curious, you can even play a song or two for them to listen and discuss.